Scotland do not need to look beyond David Moyes in their search for the best man to be national manager, according to Graeme Souness. Former captain Souness has ruled himself out of the running to replace Gordon Strachan. And, asked about his own preference, he said: "It would be a Scotsman. 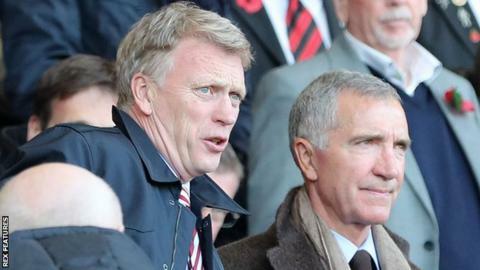 "There are several candidates, but I think David Moyes would be the outstanding one. I don't think we need to go further." Having built his reputation at Preston North and Everton, Moyes had a difficult spell with Manchester United after being chosen by fellow Scot Sir Alex Ferguson to succeed him at Old Trafford. "The United job - how do you follow Fergie?" Souness said on BBC Radio 5 live. "Whoever followed Fergie was destined to end in failure." Moyes, 54, also had a troubled spell with Real Sociedad then resigned from Sunderland in May after their relegation from the Premier League. "I know he has had a difficult time in his last job, but he is Scottish and he understands the Scottish mentality and I think you will agree we are quite different," said Souness. "I don't think the game's changed too much, he is Scottish, knowledgeable. "Even when it doesn't go well for you, you are still learning things in football. "He has had difficult times in his last job, but I'm sure he's richer for the experience." Northern Ireland manager Michael O'Neill and former England boss Sam Allardyce are among the non-Scots to appear high in the betting with bookmakers. "I don't see what they would bring to the table other than not speaking with a Scottish accent," said Souness. "I don't think there are any new ideas any new guy can bring along from a different country." Souness, 64, revealed that he had been interviewed for the Scotland post in 2008 following the departure of Alex McLeish, two years after his last club job with Newcastle United. "I had an interview at the Hilton Hotel at Edinburgh Airport and I met the three chaps involved," he said. "I thought it was going well until they asked what I would require as a salary and it went quiet in the room. "After that, I left thinking I've got a chance here and didn't hear anything then read in the newspapers they had given the job to George Burley. "They hadn't bothered to ring up and tell me in advance, so I thought this job is not for me. It wasn't then, it's not now and it won't be in the future. "Keep your money in your pocket. You won't be winning any money with me." Should Rodgers find room for realism in Europe? Read more on Should Rodgers find room for realism in Europe?